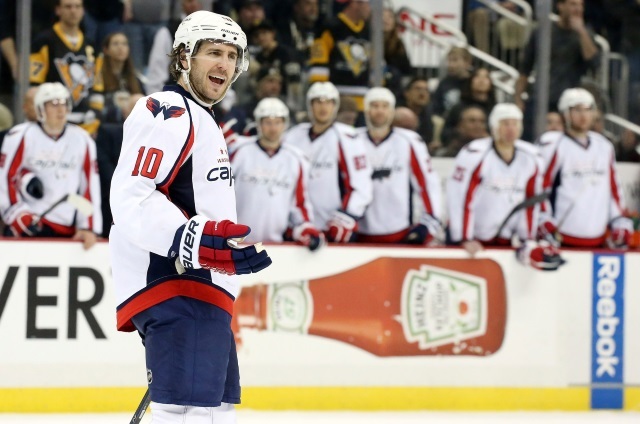 Not a surprise that the Washington Capitals remain at the top of our consensus NHL power rankings. The Los Angeles Kings and Anaheim Ducks moved ahead of the St. Louis Blues, who fell back two spots to No. 4. The Dallas Stars move back into the top five at No. 5. There were changes this week to the bottom portion of our power rankings. The Winnipeg Jets dethroned the Toronto Maple Leafs for the No. 30 position. The Maple Leafs moved up two slots to No. 28. The Vancouver continue their slide and fall to No. 29. The Columbus Blue Jackets and Edmonton Oilers remain at No. 26 and No. 27. Since we had eight entries in this weeks NHL power rankings, we’ve dropped the highest and lowest totals for each team. To get our consensus NHL Power Rankings Week 24 point total, we awarded the top team 30 points, the second team 29 points, third team 28 points, etc.